Learn about the microbiological analysis of Purified water and water for injection including the method for detection of pathogens. Water is used in various processes in pharmaceutical manufacturing. Microbial contamination in water may cause contamination in pharmaceutical products. It is necessary to analyze the Purified Water and Water for Injection (WFI) for microbial contamination. 1.1 The amount of water to be filtered depends on the expected microbial count. For higher microbial count, dilution series should be prepared. Assemble the filtration unit with filtration cap & vacuum pump. 1.2 Remove the cap of a sterile filtration unit having 0.45 micron membrane filter (diameter 47 mm) and transfer 1ml of water into the filtration unit. 1.3 Start the vacuum pump & allow the sample to flow through the membrane filter. Wash the membrane by filtering through it about 100 ml sterile 0.1% peptone water. Switch off the vacuum pump. 1.4 Remove the membrane filter using sterile forceps from the apparatus, & with the filtration side uppermost place it on the surface of sterile solidified soybean casein digest agar medium in such a way that no air bubbles form between the filter and the culture medium. 1.5 Invert & incubate the plates at 30°C to 35°C for 5 days. 1.6 After 5 days incubation examine all the membranes. Count the total no. of colony forming units on each membrane filter (i.e. no. of cfu/ml). 1.7 For determination of yeast & mold use Sabouraud chloramphenicol agar/ Sabouraud dextrose agar with antibiotic instead of soybean casein digest agar. Follow similar procedure like total bacterial count. Incubate the plates at 20 °C to 25 °C for 5 days. Examine the plates for the absence of growth. 2.1 In case of purified water & input water add 1 ml sample in duplicate in sterile Petri dishes. Pour 15 ml to 20 ml of sterile soybean casein digest agar (cooled at 45 °C). Mix thoroughly & allow solidifying the medium. 2.2 Invert & incubate the plates at 30°C to 35°C for 5 days. After incubation examine the plates for the total bacterial count. Take maximum from the two plates & calculate the no. of cfu/ml of water sample. 2.3 For detection of yeast & mold use Sabouraud chloramphenicol agar/Sabouraud dextrose agar with antibiotic & incubate the plates at 20°C to 25°C for 5 days. After incubation examine the plates for the absence of growth. Filter 100 ml of sample through 0.45 µ membrane filter. Transfer membrane filter to 100 ml sterile soybean casein digest medium and incubate at 30-35°C for 24 hours. 1.1 Streak a portion of enriched soybean casein digest medium on the surface of sterile MacConkey agar medium. 1.2 Incubate the plates at 30-35 °C for 18-72 hours. 1.3 After incubation presence of brick red colonies on MacConkey agar indicate the presence of Escherichia coli. 1.4 Carry out further confirmation by streaking the colonies on the surface of Levine eosin methylene blue agar medium. 2.1 Transfer 0.1 ml of enriched soybean casein digest medium to 10 ml of Rappaport Vassiliadis Salmonella enrichment broth and incubate at 30-35° C for 24-48 hours. 2.2 Streak above media on the surface of Wilson and Blair’s BBS agar plate and incubate at 30-35°C for 24-48 hours. 2.3 Growth of green colonies with the blank center and in 48 hours the colonies become uniformly black. Colonies surrounded by a dark zone and metallic sheen indicate the possibility of the presence of salmonella. 2.4 If subcultured on a plate of xylose-lysine-deoxycholate agar and incubate on 30-35° C for 24-48 hours. 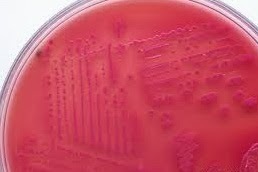 Well developed red colonies with or without black center indicate the possibility of salmonella. 2.5 Carry out further confirmation by streaking the colonies on the surface of triple sugar-iron agar by first inoculating the surface of the slant and then making a stab culture with the same inoculating needle and at the same time inoculate a tube of urea broth. Incubate at 30-35°C for 18 to 24 hours. The formation of acid and gas in the stab culture (with or without concomitant blackening) and the absence of acidity from the surface growth in the triple sugar iron agar, together with the absence of a red color in the urea broth, indicate the presence of Salmonella. 3.1 Streak a portion of the enriched soybean casein digest medium on the surface of cetrimide agar medium and incubate at 30-35°C for 18 to 72 hours. 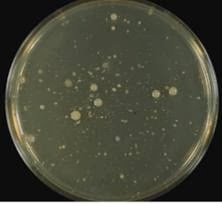 3.2 A greenish coloured colony indicates the possibility of presence of Pseudomonas aeruginosa. 3.3 Carry out further confirmation by pigment and oxidase tests. Pseudomonas agar medium for detection of pyocyanin. 3.4 Streak representative suspect colonies from the surface of cetrimide agar on to the surfaces of pseudomonas agar medium for detection of fluorescein and pseudomonas agar medium for detection of pyocyanin. 3.5 Cover and invert the inoculated plate & incubate at 30-35°C for not less than 3 days. 3.6 Examine the streaked surfaces under ultra-violet light. Examine the plates to determine whether colonies conforming to the description in Table 1 are present. 3.7 If growth of suspect colonies occurs, place 2 or 3 drops of a freshly prepared 1% w/v solution of N,N,N1,N1,tetramethyl-4-phenylenediamine dihydrochloride on filter paper and smear with the colony; if there is no development of a pink colour, changing to purple, the sample meets the requirements of the test for the absence of Pseudomonas aeruginosa. 4.1 Streak a loop of enriched culture fluid soybean casein digest medium on the surface of mannitol salt agar plate. Incubate the plate at 30-35°C for 18-72 hours. Examine the plates after incubation. 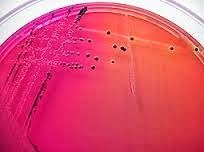 4.2 If, upon examination of the incubated plate, none of them contains yellow colonies with yellow zones the sample meets the requirements for the absence of Staphylococcus aureus. 4.3 If growth occurs further confirm by streaking the colonies on the surface of media given in Table 2 and incubate the plates at 30-35°C for 48 hours. Table 2 Tests for Staphylococcus aureus. Black, shiny, surrounded by clear zones of 2 to 5 mm. 4.4 Examine the plates to determine whether colonies conforming to the description in Table 2. If none of colony exhibits characteristics mentioned in Table 2 the sample meets the requirements of the test for the absence of Staphylococcus aureus. 5.1 Transfer 10 ml of enriched fluid soybean casein digest medium in a flask containing 90 ml of sterile Enterobacteria enrichment broth-Mossel, mix and incubate at 30-35ºC for 24-48 hours. 5.2 If growth observed streak on the plate of violet red bile glucose agar. Incubate the plate at 30-35ºC for 18-24 hours. 5.3 Observe the plate and if any colony found to perform the gram staining. If no colonies observed the sample passes the test for absence of Enterobacteria. 5.4 If gram-negative bacteria found in gram staining the sample contains the Enterobacteria. 6.1 Transfer 1 ml of enriched fluid soybean casein digest medium into 100 ml GN broth mix and incubate at 30 to 35°C for 24 to 48 hours. 6.2 Streak a loop from GN broth on the plate of xylose lysine deoxycholate agar. 6.3 Incubate the plates at 30-35 °C for 24-48 hours. 6.4 A red coloured translucent colony without black centre indicates possibility of presence of Shigella. 7.1 Heat 100 ml of the sample at 80 °C for 10 min. and cool rapidly. 7.2 Filter 100 ml water sample through the sterile membrane filtration unit. 7.3 Remove the filter from the apparatus with the help of sterile forceps and transfer it to 100 ml Reinforced medium and incubate it at 30-35°C for 48 hours in anaerobic condition. 7.4 After incubation streak a portion of the enriched Reinforced medium on the surface of Columbia agar plates. 7.5 Invert & incubate the plates at 30-35°C for 48 hours in anaerobic condition. 7.6 If no growth of microorganisms is seen, the sample passes the test.